Despite a year plagued by crashes and economic problems, the Chinese government successfully tested a brand new train capable of hitting 310 miles per hour this past weekend. The prototype bullet train is made from lightweight carbon fiber-reinforced plastics and designed to resemble an ancient Chinese sword – and it’s 100 mph faster than China’s current top of the line trains. Though many are wary of the safety of China’s railway ambitions, the Chinese government is moving forward while maintaining that safety is of the utmost concern. The high speed train that was tested was built by CSR Corporation which is based in Qingdao in eastern Shandong province. “We aim to ensure the safety of trains operation,” CSR chairman Zhao Xiaogang told the Beijing Morning News after the train’s test run. 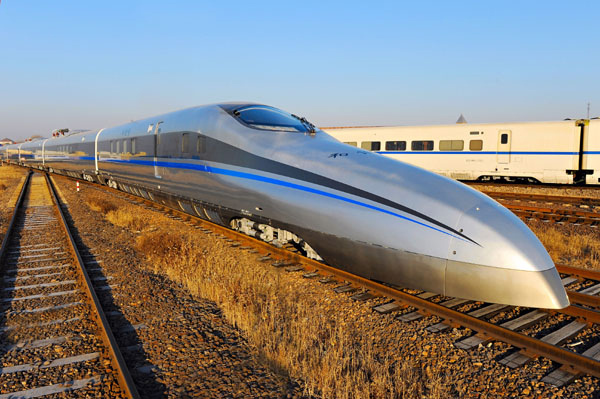 The train is capable of running at speeds up to 310 miles per hour, but the Chinese government said that though those speeds are possible the trains won’t run that fast when put into commercial use. The Chinese government had planned to shut down 80% of new construction on their ambitious high speed rail project back in July after a devastating head-on crash on an existing high speed rail line killed 40 people, injured 200, and caused a public outcry. China has also reduced speeds on existing railways throughout the country from 217 mph to 187 mph on faster lines and 155 mph to 124 mph on the slower lines. The newly tested train is built from plastic reinforced by carbon fiber and magnesium alloy, a material that reduces the weight of the trains while allowing their speed to increase. The Chinese government has announced that they plan to connect all of China’s major cities with almost 10,000 miles of new high speed rail by 2020. In the face of their year of high speed woes the Chinese government is going to cut spending on the railway by 42% from 2010 levels for the 2012 fiscal year but despite the cuts and public safety issues the government hasn’t yielded an inch on their expansion ambitions. Correction: this article original indicated that this train utilized a magnetic levitation system, however this has been amended based upon further research. That first picture is crazy, a nice new modern train on ancient wood tie based rails. I wonder how much modern track they have, because 60-70MPH is the safest you can go on wood tie rails. Despite a year plagued by crashes and economic problems, the Chinese government successfully tested a brand new train capable of hitting 310 miles per hour this past weekend. The prototype bullet train is made from lightweight carbon fiber-reinforced plastics and designed to resemble an ancient Chinese sword - and it's 100 mph faster than China's current top of the line trains. Though many are wary of the safety of China's railway ambitions, the Chinese government is moving forward while maintaining that safety is of the utmost concern.